I have a confession: I have never used Tofu in my cooking before. It was never appealing to me, nor did I know how to cook it. What changed my mind? I went to a friend’s house and she prepared a delicious vegetables and tofu stir fry recipe. At first, I was skeptical to taste it but I did not want to disappoint my friend. I gave it a try and let me tell you: I was missing out. The stir fry was so good that I asked for another serving! Even my picky teen loved it. He asked me to prepare a similar meal. You know when my picky child asks for a meal, I make it. As simple as that. Give the kids what they ask for (within limits of course). A few days later, I made this delicious and easy tofu stir fry with one of my favourite sauces: Blue Dragon Sweet And Sour Stir Fry Sauces. What I love about these meals: they are easy to prepare, quick and all the family members enjoy them. What I loved about using tofu is that it is a nice replacement to meat, cost effective and very quick to cook. With the meat prices going through the roof, I am trying to find other protein alternatives that don’t put my food budget into the red. 1 tofu package: extra firm. Dice it into small cubes. 1 package of frozen vegetables. I went with oriental style (a mix of broccoli, carrots, celery, etc) You can use fresh vegetables but at this time of the year, they are so expensive. To give you an idea: 1 cauliflower costs almost $9. Frozen vegetables have almost the same nutritional values and they are handy (no chopping, prepping). Add vegetable oil, ginger and garlic. Let them cook for one minute until they soften. Make sure to stir regularly. Cook few minutes and set aside. In the same pan, add vegetables and onions, the remaining Blue Dragon Stir Fry sauce and cook for few minutes or until vegetables soften. Add the tofu mixture. Cook for 1 minute while mixing well. Transfer into a nice dish and enjoy. You can serve it with your favorite noodles, rice or quinoa. Isn’t this an easy and delicious dish? Give it a try and I am sure all your family will love it. If you’re looking for more delicious vegan recipes, check out my vegan mashed cauliflower made with Blue Dragon Sesame Oil! Want to stretch your budget by avoiding red meat, but not quite ready to make the leap all the way to vegetarian? Other great alternatives include Grilled Avocado with Shrimp and Juicy Grilled Chicken Breast Recipe with Hoisin Sauce. 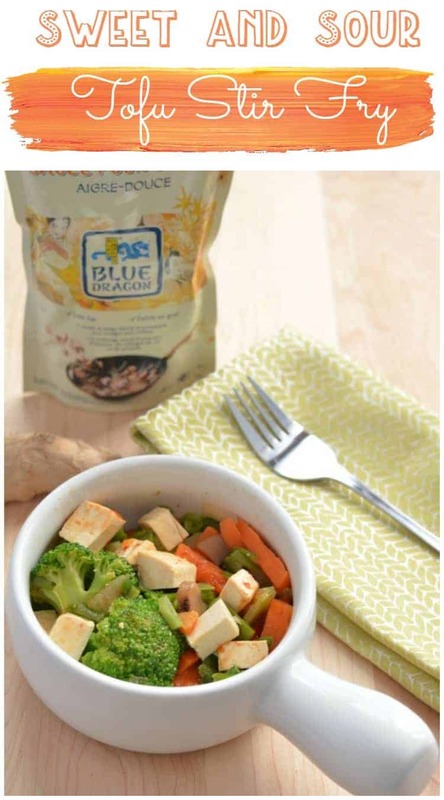 Head over to the Blue Dragon Canada website to learn more about all their delicious sauces. Connect with Blue Dragon Canada on Facebook and Twitter to check out more great ideas! Have you ever made a tofu stir fry before? What are your favorite meatless recipes? Tell me in the comments! My favourite meatless recipe is vegetable soup. I like veggie stir fry! I love salads, I loaded with vegetables and almond! I make a delicious chili with soybeans. We eat meatless salads every day for lunch. I like to add egg, lentils or beans to mine. Looks so delicious and amazing!!! yummY! Great giveaway! I make an awesome vegetarian chili. On another note, I’m really trying hard to master tofu. It is so versatile and so easy to mess up haha. I’ve figured out a couple things but I’m still very much a tofu amateur. My favourite meatless dish is black bean burgers. They have so much flavour and they dress up beautifully! I like pasta bake with lots of mozzarella on it. I love zuchinni pasta with marinara sauce! I have never tasted or cooked tofu before. I think I would be more apt to try it if I had the same experience as you, and tried it when someone I know made it. I’ve never had a dish with tofu but this looks really good. Perfect for a meatless Monday dinner. I love sweet and sour sauce! It’s one of my favorite asian flavors! I so needed some tofu inspiration. Thanks for sharing this, will have to try, it sounds delicious ! My family will love this recipe. I will have to try making it this weekend. This looks so delicious and easy to make. I will have to try this for our meatless Wednesday. My favorite vegetarian meal to make is chili. This looks like a delicious recipe. I will have to pick up some Tofu so i can try this recipe. We do a few meatless meals a week. I like to make Stir-fry. I am always looking for a new vegetarian recipe to try. Mac and Cheese has to be my favorite. That stir fry looks great! Stir fry is one of my favorite dishes. It’s so good with many different veggies. I love it! Your recipe looks delicious too! I have never made a tofu stir fry or any other meal with tofu. My favorite meatless meal has always been cheese pizza. Our go-to meatless meal is veggie chili and veggie curry. 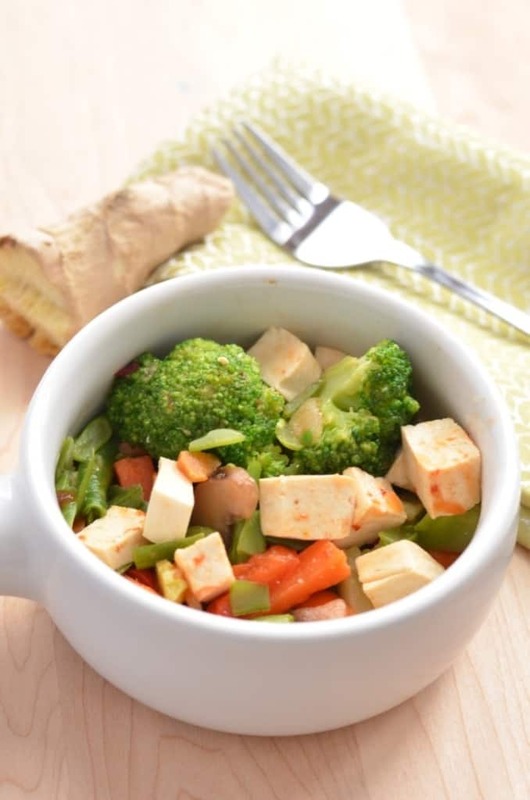 I love using firm tofu in these dishes. I have cooked with tofu a couple of times before when I was feeling brave. It turned out okay, but not great. I would be willing to try it again. I just need the right recipe like this one! oh boy, I’m going to have to give it a try! I too have never used tofu in my kitchen, I will have to try some recipes and see if I’m missing out! Thanks for the info! I have definitely made stir fry dishes before but none with Tofu. The only time I ever remember tasting anything with Tofu in it, was when I ordered a Miso Soup at a Restaurant and they put a few chunks of Tofu in it. I have never tried personally adding it to any of my dishes though so thanks for sharing the recipe! That looks really good! I have never tried tofu myself either. I’m glad you like it, it makes me want to try it too. This sounds like a yummy recipe. I never understand it when people dis tofu. It’s great. It takes on all the flavors of whatever you cook it with, and it has a great texture. This looks so eady, I think I’ll give it a try. I will be passing the recipe to a friend though. She’s a vegetarian and loves tofu, I think she’ll love this. That sounds really good. I love the texture, and I love how it takes on other flavors, as well. The sauce sounds really yummy! I hadn’t cooked tofu before either, but had eaten it a lot in restaurants. I found out that it was pretty easy to do! This looks mighty easy and also pretty tasty. The thing with tofu is it needs something to kick it up a notch. I love pasta salad with fresh veggies. I love tofu, it’s one of my favorite ingredients. It’s healthy and it absorbs flavor really well. Thanks for this awesome recipe! I like three cheese cannelloni. I love tomato basil pizza. I like eggplant spaghetti as a meatless meal.